The Ben Lomond adoption program is a community based response to a critical ecological issue that is threatening the Ben Lomond (One Mile) Basin. For nearly 100 years, wilding conifer trees have spread up the slopes of Ben Lomond replacing the native flora and creating a single dense forest. This encroachment destroys both tussock and beech forest and means the complex ecosystem of birds and insects they support is lost forever. The invasion of the upper slopes is now well advanced and without immediate community action Queenstown will lose the iconic Otago landscapes and stunning mountain and lake views Ben Lomond provides. 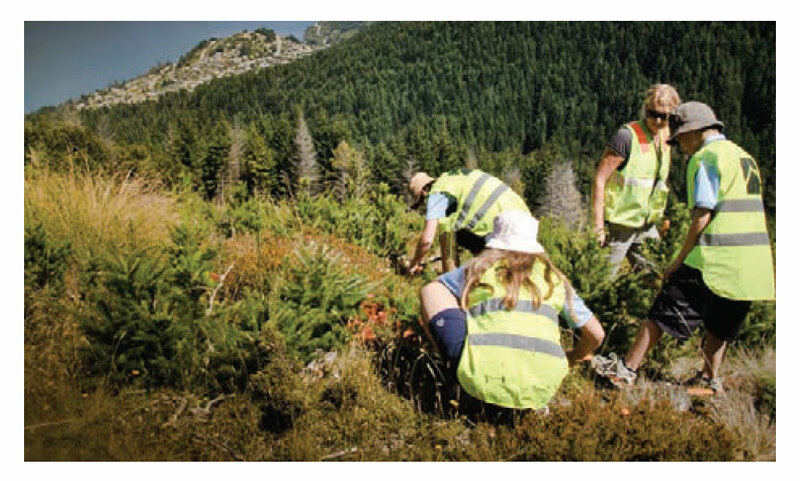 For the past 5 years, a small group of volunteers have worked to contain the spread of wilding conifers into the upper basin. However, the mature conifer forests represents a massive seed source and volunteer efforts have only served to delay the invasion. 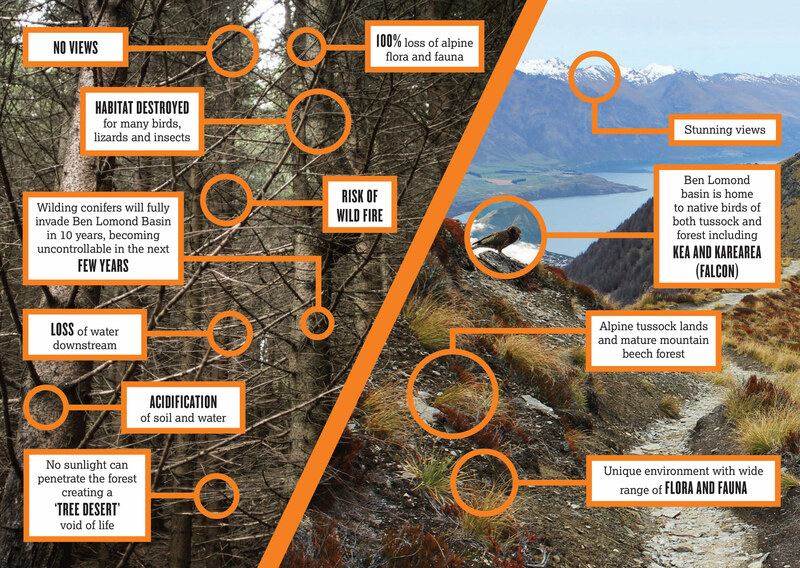 WILDING CONIFERS affect approximately 1.7 MILLION HECTARES of New Zealand and are spreading around 5% ANNUALLY impacting tens of thousands of hectares every year; They can cause the loss of native ecosystems and SPECIES EXTINCTION, impact our iconic tourist landscapes, reduce water yields and increased the risk of WILD FIRES. Spraying of this area is not a wise option as the fragile flora and fauna would be badly impacted. Now we need your help, Adopt A Plot represents a new approach to the problem. 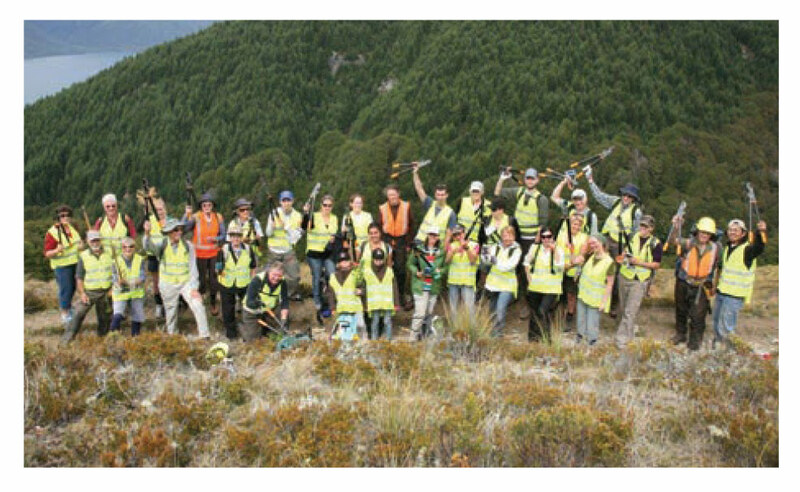 Rather than a few volunteers looking after a large area, the program seeks to engage with many people who can provide intensive control of smaller areas. Under this scheme, community groups, businesses, schools, and family groups will adopt a specific area of the basin. Each group will be responsible for hand clearing their plot of seedlings and then maintaining the area to prevent regrowth. The WCG will help interested parties select a suitable plot and then provide ongoing support including training, advice and loan of tools and equipment.